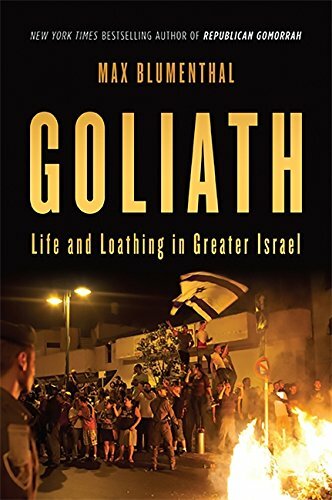 Max Blumenthal's Goliath is a brave and important book. Blumenthal raises the alarm on a rising tide of racism and close-mindedness in modern Israel that is increasingly based in the ideology and policy supported by the country's youth. To draw attention to this cultural crisis and stimulate action the book features examples of some of the most disgusting manifestations of the shift in national attitude including an apparent paranoia concerning the prospect of Arab men gaining sexual access to Israeli Jewish women. It is the more widespread and more prosaic fears among Israelis that are the most disturbing, however. Among observant Jews who are otherwise demographically aligned with the country's right wing base, the vast majority would have a problem with an Arab for a next-door neighbor. Moreover, traditionally more leftist secular Jews report that same segregationist view at a rate of about 47% (according to my best recollection). Blumenthal considerably enhances the impact of his message by moving beyond disturbing poll data as well as poignant stories of these ideas in action in particular newsworthy incidents. In particular, he wisely showcases a primary source from an Israeli teachers' association expressing the widespread racist ideas among their students and worse still, the difficulty they are experiencing in opening their students' minds to different perspectives on such politically charged topics. When as a culture you are losing the ability to think independently, consider diverse points of view, and consider the situations of people different from yourself with sympathy, your culture is in decline. Anyone who cares about modern Israel and Jewish culture could benefit from reading this book as a first step in actively trying to improve the current Israeli discourse on Palestinians and the Arab world. While Blumenthal isn't concerned with laying out a discrete comparison to apartheid, as mentioned earlier, the stories he tells makes it hard to not think of the parallels to a part of America's history that we're more familiar with: the Jim Crow-era South. Like then, Palestinians and Israeli Arabs face a mixture of both de jure and de facto structural racism, discrimination that not only depresses their economic futures but also exacts a deep personal cost such as police harassment, jail time, separation of families, and violent eviction from their homes. Some of the stories are so stunning as to make me think of the Indonesian public in The Act of Killing: a sort of blasé indifference that's just as morally damning as if they were directly responsible. And in many cases, they are directly responsible through the universal conscription that makes many execute the practical roles of the occupation. Blumenthal especially indicts the Zionist Left in this aspect; they often willingly enter service as “change from within”, but whatever change they enact is impossible to see, and they often disengage afterwards from any sort of moral responsibility for their actions. If the book has any flaws, it's in a messy structure. The book is a series of short chapters or episodes that illustrate aspects of the day-to-day reality in Israel and Palestine, sort of like The Forever War by Dexter Filkins. Unlike Filkins, though, Blumenthal isn't evocative enough (and succinct enough) to keep this technique from grinding the reader down. I had to take several breaks of a few days, since the book is so unremittently bleak. (It didn't help that I was concurrently reading a book on the AIDS crisis!) But under full consideration, the book is Important in a way that excuses the flaws, determined to thoroughly catalogue the current Israeli state of affairs, and warn of how it's spiraling out of control. How depressing - how ironic that a people that suffered so grievously at the hands of the Nazi's should visit such xenophobia and apartheid on others. And oh how we in the West have these facts obscured and hidden from us. Eye opening.